1. A period of time after a deplorable, or terrible, and usually destructive event: In the aftermath of the brush fires, many of those who lived in the area were in need of shelters. There are some countries which are still trying to rebuild their economies in the aftermaths of attacks by terrorists. 2. 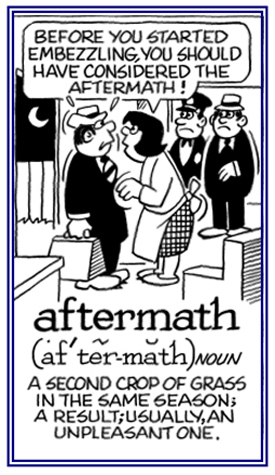 Etymology: Originally, and literally, an aftermath was a second crop of grass or similar grazing vegetation, grown after an earlier crop had been harvested in the same season. By the mid 17th century, it had taken on the figurative connotation of "resulting situation" which is now its primary meaning. © ALL rights are reserved.